These tender barbecued or griddled vegetables have a subtle smoky flavour, and make an interesting change from the usual crudités. To make the aïoli, place the garlic in a blender or food processor and season. Add the egg and lemon juice and blend for about 1 minute until frothy. Then, with the machine still running, gradually pour in the olive oil in a fine and continuous stream, until the mixture has emulsified to a thick, shiny mayonnaise. To prepare the artichoke, use a sharp knife to cut off the top third of the artichoke to expose the top of the heart. Cut the stalk off at the base and discard. Pull away and discard the tough, woody outer leaves and cut the artichoke into quarters. Scoop out the fibrous choke in the centre of the heart with a teaspoon and discard. Cut each of the artichoke quarters into 2 wedges. Then cut the aubergine into similar size wedges. 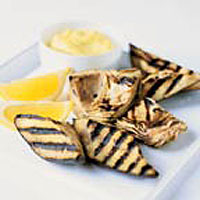 Brush the artichokes and aubergines generously with the olive oil then place on the barbecue or griddle pan for 15-20 minutes until tender in the centre, turning once to get the chargrilled stripe effect. Serve immediately with the aïoli and lemon wedges. Safety note: This recipe contains raw egg and is not suitable for elderly people, young children, pregnant women or those whose immune systems are weak. Save time by serving the vegetables with Waitrose Garlic Mayonnaise instead of making your own aïoli.